Hello Kitty is up there with Barbie and Polly Pocket when it comes to nostalgic toys and characters we loved as children. 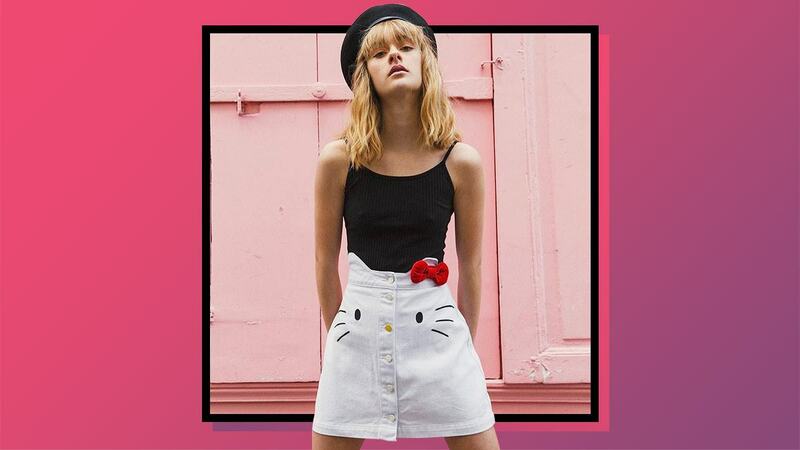 But if you ever need proof that a grown woman's never too old for the Sanrio cat—er, excuse us, little girl—this incredibly millennial clothing line is it. '90s-tinged and minimally (or maximally, as is the case for one long-sleeved top) emblazoned with the character's image, the pieces in the Hello Kitty x Lazy Oaf collection are bound to shoot up your wishlist if you're a fan. But even if you're not, these clothes perfectly encapsulate the relaxed retro streetwear aesthetic that's so ~trendy~ these days—needless to say, they're very Instagrammable, too. There's no way you can wear this skirt and not be happy. Gingham is the pattern of the moment, and we love how this pair subtly references Hello Kitty via tiny red bows. View the entire collection, which also includes a denim jumper we swear we wore in the third grade, on London-based Lazy Oaf's website here.